Embrun is a town in Ontario in Canada. While Embrun is part of the officially designated National Capital Region, it is usually considered to be part of Eastern Ontario. It is situated in between the towns of Casselman and Russell. It is located about 30 minutes southeast of Ottawa. It has a population of about 8,000 (2006). Embrun is a growing town and new businesses and homes are being built. Embrun is one of the fastest-growing towns in Eastern Ontario by doubling its population in 25 years (Embrun had just 3,800 people in 1980). This has led to confusion about how big Embrun is since many data sources are out of date. Embrun is an unincorporated community. This means that although Embrun does exist, it does not have its own municipality. Instead it is part of the Russell Township, sometimes just called Russell. This has led to confusion between Russell Township and the village of Russell, a small village also located in Russell Township. The important thing to understand here is that Embrun and Russell are separate towns and that both of them together form the municipality of Russell Township (sometimes called Township of Russell). Embrun follows the small town stereotype of "everyone knows everyone". Many people know or have acquaintances with most other residents of the town. This is especially true among senior citizens. If you have any questions about how to get somewhere, then many people will be glad to help. Senior citizens are particularly helpful. There are several social clubs which are very active in activities in the community such as: The "Club Optimiste Club", Knights of Columbus, Octogone club, Carnival committe and Celebrons ensemble committe. These social clubs organize community related activities for children, young adults and seniors during the holiday season, during the "Embrun Carnival"(usually the last week of January each year) and Celebrons ensemble(yearly summer celebration of community). Activities are all sponsored by local businesses and encourage solid community relations. Embrun is mainly francophone. 60% of the town's population speaks french at home. Despite this, however, many signs are bilingual (although bilingual signs are not required in Embrun) and in stores cashiers will often understand English. Even so, knowledge of a few basic words in French is useful. See the French phrasebook on Wikitravel to learn basic words in French. There is pretty much only one way to get to Embrun: By car. If you are coming from Ottawa, travel east (in the direction of Montreal) on Highway 417 and get off at Exit 88. The sign for Exit 88 says "Rockdale Road: Vars, Embrun". It takes about 25 minutes to get to Embrun from the Innes-Walkley area, 30 minutes from the St. Laurent area, 35 minutes from Orleans, 35 minutes from Downtown Ottawa, 40 minutes from the West End, and 50 minutes from Kanata. If you are coming from Montreal, travel west (in the direction of Rigaud and Ottawa-Hull) on Highway 40. Once you hit Ontario, it will become Highway 417. Get off at Exit 79. The sign for Exit 79 says: "Limoges Road: Limoges, Embrun". It takes about 90 minutes to get to Embrun from the West Island, 100 minutes from the Dorval/Saint-Laurent/Pierrefonds/Cartierville area, 110 minutes from the Mont-Royal/Centre-Ville area of Montreal, 115 minutes from Vieux-Montreal and 120 minutes from the Montreal-Est area. Getting around Embrun by car is easy. 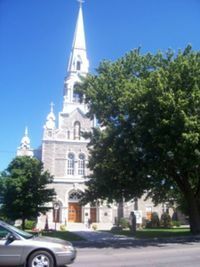 Most of the town's tourist-related buildings and areas are accessible off the main road, called Notre-Dame Street. In addition, there are several parking lots along the road. While harder, one can get around Embrun on foot. The business park area in the western part of the town (near where Exit 88 hooks up with Embrun) has many stores fairly close together. However, walking from the western part of the town to the eastern part of the town can take almost an hour. Overall, travelling around Embrun on foot is the least desirable means of getting around town. Traveling around Embrun by bicycle is quite convinent. In the western part of the town, a bike trail links several streets. In the central part of the town, a pedestrian lane on the side of Blais Street hooks up with the bike trail. From there, one can travel on Centenaire Street, a relatively traffic-free road, to get to the eastern part of the town. Bicycle rentals are available at Vélo Xpress, located at 968 Notre-Dame Street. Vélo Express can be reached at 1-613-443-5500. The Église St. Jacques -- A beautiful 19th-century church located in the heart of the town at the junction of St. Augustine Road and Notre-Dame Street. This is sometimes called the "Paroisse St. Jacques" or among the anglophone population, "St. Jacques Church". It is very hard to miss. It is located along the Main Road. They have a website: www.paroissestjacques.com, but the website is in French only. New York Central Recreational Trail -- Pedestrian trail lined with trees that block the view of the urban features of the town. The New York Central Recreational Trail is free to access. A parking lot in the central part of the town is the start of the trail, which continues for several kilometres into Russell. Be sure to use insect repellent in the summer as mosquitos and black flies are common among the bike path. Walking or bicycling down the bike path is a relaxing experience. Monument to Embrun, Ontario from Embrun, France -- Monument dedicated to Embrun, Ontario from Embrun, France. This is a public monument, so there is no price in seeing it. Is it located at the parking lot at the start of the recreational trail. Written on both sides is a message from Embrun, France that discusses about how Embrun, France is grateful for the Allied liberation of France in 1945, which soldiers from Embrun, Ontario contributed to. However, this text is in French only. Picking strawberries at Fraisière Cosmos. 1407 Notre-Dame Street, Embrun, ON, K0A 2M0. 1-613-443-3725. Fraisière Cosmos is a strawberry farm along Notre-Dame Street east of the town. Strawberry picking is available in late June only. Bay Street Salon & Spa 170 Bay Street, Embrun, ON K0A 1W1. 1-613-443-7700, .. www.baystreetsalonandspa.ca. A beautiful day spa. Massages and treatments are offered. Packages are available. La Chocolatière, 1110 Notre-Dame, Embrun, ON. K0A 1W0. 1-613-443-7262, . Open Thursdays from 5PM-8:30PM and Saturdays from 9AM-noon. Handmade truffles and fine chocolates. Gift boxes are available. Lucky 7 Sports Bar Restaurant, 767 Notre-Dame Street, 1-613-443-1221,. Restaurant located in the Place d'Embrun mall in the business district. The food is quite good and the prices are fair, but recently the restaurant has gotten less customers, so it may close or lower its prices over the course of the next few years. This restaurant serves a variety of foods, from Soup to Pizza and Potato Skins to Shrimp and Salad. Mid-range prices. The Lucky 7 (contact information above in the eat section) serves as a sports bar. Au Boisé Bed and Breakfast,2048 Route 600, P.O Box 382, 1-613-443-2010, . Good Bed and Breakfast, located just to the southeast of the town. La Clé de Champs Bed and Breakfast, 1566 Ste. Marie Road, 1-613-443-5348 . Bed and breakfast located in a victorian style home south of the town. While in Embrun, you can also visit the small town of Russell. Russell is a short drive away from Embrun.Russell is a beautiful town with a more rural feel than Embrun. To get to Russell, drive west on Notre-Dame Street. It becomes Castor Street, which leads into Russell. Like getting in, the best way to depart the town is by car. Refer to the Get in section above for directions and travel times. This page was last edited on 28 May 2017, at 05:07.